The Symbol VRC8900 has been discontinued. No direct replacement is available. The new VRC 8900 mobile data terminal from Symbol Technologies is an industry first a rugged device for use in the toughest environments with the industry-standard Windows CE operating system and a full-screen color display. Sealed for protection against dust and water (to IP65 standards) and shock-tested to 24G the VRC 8900 is reliable in the most extreme temperature and environmental conditions and easily tolerates sub-zero freezers as well as the vibration and repetitive pounding of forklift applications.Designed for distribution centers factory floors and warehouses the VRC 8900 supports real-time receiving tracking put-away picking and shipping and 1D and 2D scanning applications and delivers a new level of benefits wherever implemented. 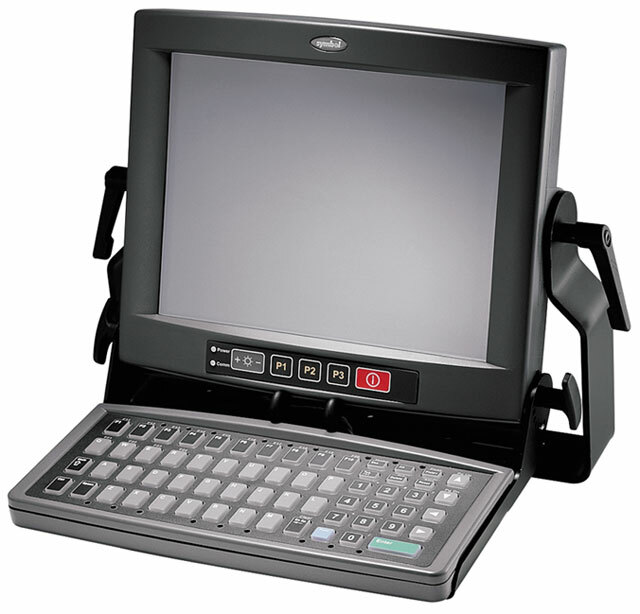 The new VRC8900 mobile data terminal from Symbol Technologies is an industry firstï¿½a rugged device for use in the toughest environments with the industry-standard Windows CE operating system and a full-screen color display. Sealed for protection against dust and water (to IP65 standards), and shock-tested to 24G, the VRC8900 is reliable in the most extreme temperature and environmental conditions, and easily tolerates sub-zero freezers as well as the vibration and repetitive pounding of forklift applications. Designed for distribution centers, factory floors, and warehouses, the VRC8900 supports real-time receiving, tracking, put-away, picking and shipping, and 1-D and 2-D scanning applicationsï¿½and delivers a new level of benefits wherever implemented. The rugged design and innovative features of the VRC8900 enable immediate data capture and exchange in virtually any factory or warehouse environment. The result is a faster, better decision-making process, increased productivity, and a positive impact on profitability. The VRC8900 is backed by Symbol's worldwide service repair and support network.